Megan is the director of Ti Kay. She studied Chemistry at Harvard and then received a PhD(DPhil) from Oxford in Mathematical Models of Infectious Disease (HIV transmission) and an MD from Harvard. She completed her medical residency at Massachusetts General Hospital and her Infectious Disease Fellowship at UCSF. She is boarded in Internal Medicine and Infectious Disease. 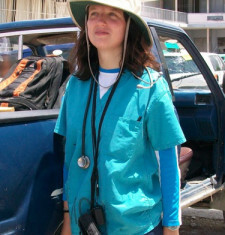 She established the initial TB clinic with a Haitian nurse in a tent with 3 patients in January 2010. She spent over 4 years full time in Haiti after opening the main clinic in 2010. After the closure of the hospital clinic, she has been splitting her time between Haiti and elsewhere. Megan Coffee se direktris ak fondatè Ti Kay. Li te fè bakeloreya l nan inivèsite Harvard, kote li te etidye chimi. Aprè sa li te fè yon doktora nan inivèsite Oxford nan Modèl Matematik Maladi Kontajye (sou transmisyon VIH) epi li te gradye nan medsin nan inivèsite Harvard. Li te fè fòmasyon medikal li nan Massachusetts General Hospital (Lopital Jeneral Massachusetts) ak yon lòt fòmasyon ki pi avanse toujou sou maladi kontajye nan Inivèsite Kalifòni, San Francisco (UCSF). Li kalifye an medsin entèn ak maladi kontajye. Se te li menm ki te etabli premye klinik TB a avèk yon enfèmye ayisyen anba tant, avèk twa malad, an janvye 2010. Li te viv an Ayiti pou 4 ane anvan klinik la fèmen. kounye a li pase tan nan Ayiti ak yon lòt kote.